You can make PECU deposits with your mobile device conveniently and securely from almost anywhere! e-Deposit is the fastest way to deposit checks. 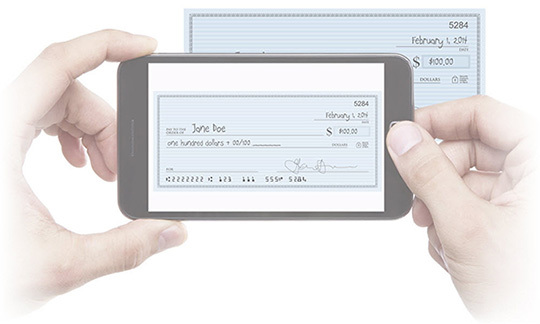 Save time, money and gas by simply using your smartphone camera or mobile device to take photos of the front and back of your check and then submit them electronically to PECU. You receive a confirmation for each successful deposit. You can access this handy service from our e-Branch—located in the top-right corner of our website. Log-in to e-Branch and choose e-Mobile RDC Sign-up under the e-Mobile heading. NOTE: Deposits made by 2:00 PM each business day will post on the same day. Deposits received after 2:00 PM will be posted the following business day. All e-Deposits follow the same funds availability policies as in-person deposits. Login to e-Branch using your Login ID at www.pecutx.org in the top right corner. Wait 1-3 business days for a secure message from PECU Financial Services saying your e-Deposit access has been approved. This can be found under e-Messages. You may now download and use the PECU Mobile App on your mobile device to perform e-Deposits. 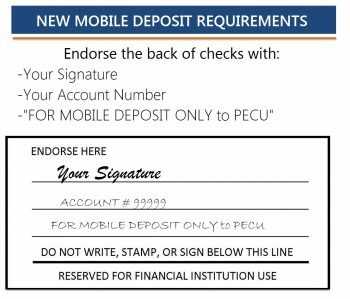 Endorse the back of the original check with the following information: your signature, your PECU account number, and “FOR MOBILE DEPOSIT ONLY to PECU.” If you fail to include that endorsement your check may be rejected for deposit by PECU Starting July 1st, 2018. Login to your PECU account on the PECU Mobile App. Tap on the Deposit into dropdown. Select desired share and tap Done once desired share is highlighted. Tap on the Amount field and type in the amount of the deposit. Tap Done. You will see a screen that says Capture Front of Check. Tap Capture Image. Align the corners of your check with the white corners you see on your screen and tap Capture to capture an image of the front of the check. If the image looks fuzzy while you are in the process of trying to take the picture you can tap on the image of the check you are seeing and it refocuses the camera. If the image is good, tap Use. You will see the image is sending and a message will come up Your media was sent successfully. Tap Close. If you need to get a better image, tap Retake. You will see a screen that says Capture Back of Check. Tap Capture Image. Align the corners of your check with the white corners you see on your screen and tap Capture to take an image of the back of the check. If the image is good, tap Use. You will see the image is sending and a message will come up Your media was sent successfully. Tap Close. Review your check images and press Submit. If the images are good, the deposit will be sent for processing. If the images are not good, you will see a message Cannot read check. Please retake photo. Suggestions for good photos include steady hands, good lighting, and four check corners visible. Tap Back to go back and re-capture better image if necessary. Tap Cancel at any time to cancel the deposit. If you have questions about e-Branch or making a mobile deposit, please call us at 512-474-1955 (or 800-772-1955 outside Central Texas) and ask for a PECU Financial Services representative.